Blog › Does Getting Married Win Tennis Trophies? Wimbledon 2015 starts with Andy Murray as one of the favourites to lift this most coveted of tennis trophies. 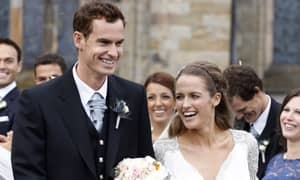 The Wimbledon and US Open-winning player married his long-term girlfriend Kim Sears in a ceremony in his hometown of Dunblane in bonny Scotland on Saturday 11th April. The couple, both 27, exchanged vows at the 12th Century Dunblane Cathedral before making their way to a small reception for family members and close friends at Andy’s own luxury Cromix Hotel, in Kinbuk, Perthshire. But does getting married make you a better player? Will it sap Andy’s strength or spur him on to win tennis awards and this most prestigious tennis trophy? "Marriage works" on the lens of the camera filming the match. The Scotsman married Kim Sears in Scotland's celebrity wedding of the year recently. When you watch Wimbledon this year, check out Andy Murray’s wedding ring threaded on one of his trainer laces. The big softy! So, does love conquer all; or at least at Wimbledon? We will see. I predict Andy will win this most prestigious of tennis trophies. Or will it be one of the other famous tennis players, Djokovic, Wawrinka, Federer or Nadal? The Wimbledon men's singles tennis trophy stands 18-and-a-half inches high and has a diameter of 7- and-a-half inches. Strangely enough, no one quite seems to know what the carving of a pineapple is doing atop this magnificent cup. One theory says it has to do with the tradition of British navy captains putting a pineapple atop their gateposts on returning home from sea. Why not buy your sports trophies and tennis trophies from CSK trophies and Medals. Our range includes gold cup with silver bowl awards, male and female figures, mahogany plaques, five star tennis trophies and tankards are available too, all individually boxed. Simply select the tennis trophies you wish to purchase, and then enter the personalised message that you require, engraved for free. All our tennis trophies are ideal to present winners with, as we supply a large variety of different styles and materials to suit every players dream. CSK have ideal tennis awards for your club, whatever, the league or cup competition. If you have any questions regarding our tennis trophies, please contact CSK today. CSK have a vast range of value for money, superb quality tennis trophies for all levels, abilities and occasions. There is FREE engraving with all our trophies.